We believe in building successful relationships. It is our goal that our clients bring their highest expectations because that is what they will receive from us. In a constantly changing market, we remain prepared and able to adapt to local and foreign market conditions. Trust and confidence is key in any real estate relationship, and Golf and Gulf Estates provides both of these to its clients. Specializing in luxury golf and waterfront properties has become a passion. Providing intimate service with constant communication our main goal. When hiring Golf and Gulf Estates you will always receive personal care. We will be on your side working tirelessly to make sure your specifications are met. Whether selling or buying our number one goal is maximizing your investment. We are constantly up to speed with new listings and marketing tools that help home buyers through the process and provide sellers with the exposure they demand. Please call us for an in-depth consultation and confidential discussion. We believe in building successful relationships. It is our goal that our clients bring their highest expectations because that is what they will receive from us. In a constantly changing market, we remain prepared and able to adapt to local and foreign market conditions. Trust and confidence is key in any real estate relationship, and Golf and Gulf Estates provides both of these to its clients. 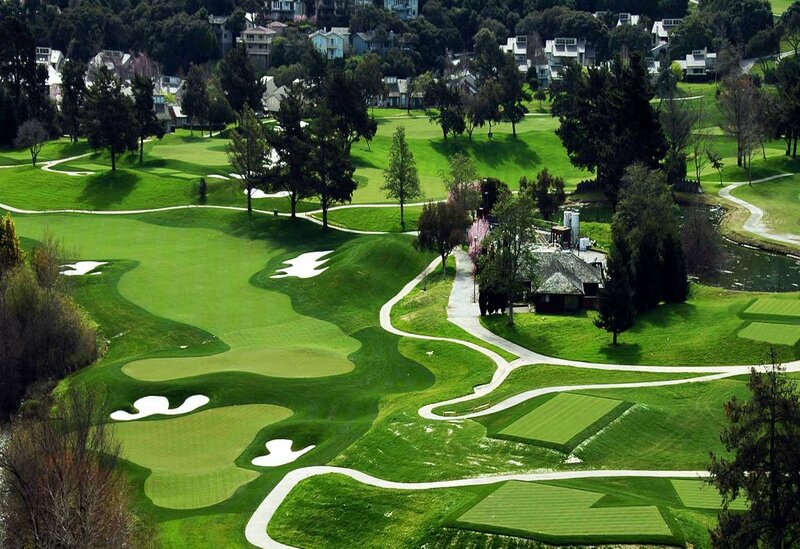 Specializing in luxury golf and waterfront properties has become a passion. Providing intimate service with constant communication our main goal. When hiring Golf and Gulf Estates you will always receive personal care. We will be on your side working tirelessly to make sure your specifications are met. Whether selling or buying our number one goal is maximizing your investment. We are constantly up to speed with new listings and marketing tools that help home buyers through the process and provide sellers with the exposure they demand. Please call us for an in-depth consultation and confidential discussion. 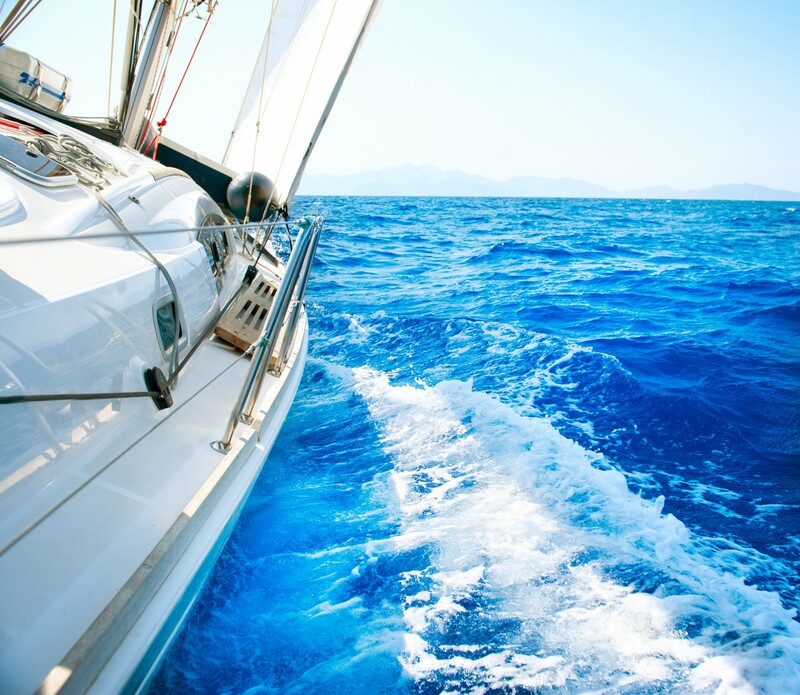 When considering a move to Naples seasonally or year round it is important to have an understanding of the past to appreciate the present and see the future. Naples was founded around the late 1880s by former Confederate General and Kentucky U.S. Senator John Stuart Williams and his partner Walter N. Haldeman. Its sugar sand beaches were compared to those of the Italian peninsula of Naples, Italy. This is where the name Naples originated. 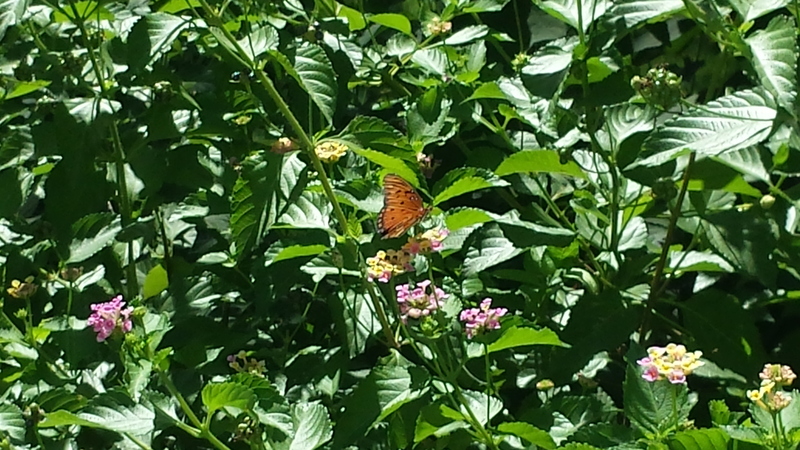 As decades passed news spread quickly of the mild climate and abundant fish and game. Soon Haldeman, owner of the Louisville Courier Journal, purchased land and founded Naples. One of his first projects was building a 660 foot fishing pier out into the Gulf of Mexico. Back then you could purchase land for around $125.00 per lot on the beach. Amazing how times change. 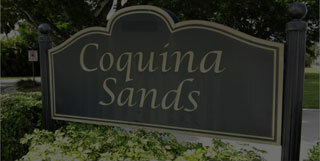 Still considered an extremely sound investment, Naples' beach lots are now well into the millions. Fast forward to 1927 when the railroad finally reached Naples FL. Construction of Tamiami Trail had begun in order to link Naples to Miami but wasn't completed until 1928. The road took 13 yrs. to finish and cost $8 million. They used 2.6 million sticks of dynamite in its construction. During the war the U.S. Army Air Forces built a small air field for training and it is now the beautiful and exclusive Naples Municipal Airport. As the late 1940's approached the area know as Aqualane Shores came to be. 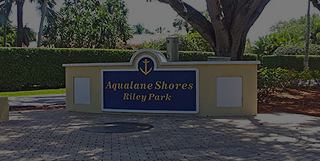 Dredged, filled and designed out of necessity, Aqualane Shores was birthed from a Hurricane. The numerous water ways were created out of mangrove swamps. Many areas were not conducive for dredging and therefor filled which created stunning waterfront lots with easy access to the Gulf of Mexico. 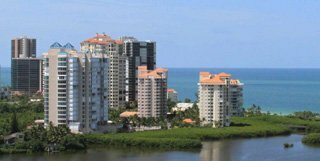 The navigable waters of the canals and expansive lots are a distinctive feature to the south portion of Naples. Today with world-renowned beaches, golf courses, restaurants and vacation lifestyle, Naples is the crown jewel of Southwest Florida's Gulf Coast. Visited by people from all over the world. 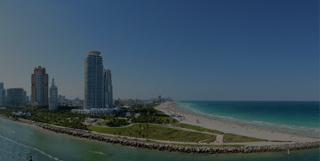 According to the American Census, it is one of the fastest growing Metropolitan areas for growth and Bloomberg has Naples slated to be #1 in economic growth as well. The demographics are changing everyday bringing a zestful new vibe. Come see what everyone is talking about! Residential fires take their toll every day and year, in lost lives, injuries, and destroyed property. According to the National Fire Protection Association, a home structure fire was reported every 86 seconds in the U.S. in 2014. Taking the time for some simple precautions, preventive inspections and concrete planning can help prevent fires in the home and can save lives should disaster strike. All electrical devices including lamps, appliances, and electronics should be checked for frayed cords, loose or broken plugs and exposed wiring. Never run electrical wires, including extension cords under carpet or rugs as this creates a fire hazard. Fireplaces should be checked by a professional chimney sweep each year and cleaned if necessary to prevent a dangerous buildup of creosote. Cresote can cause a flash fire in the chimney. Cracks in masonry chimneys should be repaired and spark arresters inspected to ensure they are in good condition and free of debris. When using space heaters, keep them away from beds and bedding, curtains & papers (anything flammable.) Always follow the manufacturer’s instructions for use. Space heaters should not be left unattended or where a child or pet could knock them over. Use smoke detectors with fresh batteries unless they are hard-wired to your home’s electrical system. Smoke detectors should be installed high on walls or on ceilings on every level of the home, inside each bedroom and outside every sleeping area. Statistics show that nearly 60% of home fire fatalities occur in homes without working smoke alarms. Most municipalities now require the use of working smoke detectors in both single and multi-family residences. Children should not have access to or be allowed to play with matches, lighters, or candles. Flammable materials such as gasoline, kerosene or propane should always be stored outside and away from the house. Kitchen fires know no season. Grease spills, items left unattended on the stove or in the oven and food left in toasters or toaster ovens can catch fire quickly. Don’t wear loose fitting clothing, especially with long sleeves around the stove. Handles of pots and pans should be turned away from the front of the stove to prevent accidental contact. Keep all-purpose fire extinguisher within easy reach. Extinguishers specifically formulated for grease and cooking fuel fires are available and can supplement an all-purpose extinguisher. Have an escape plan. This is one of the most important measures to prevent death in a fire. Visit ready.gov for detailed information on how to make a plan. Local fire departments can also provide recommendations on escape planning and preparedness. In addition, all family members should know how to dial 911 in case of a fire or other emergency. Live Christmas trees should be kept in a water-filled stand and checked daily for dehydration. Needles should not easily break off a freshly-cut tree. Brown needles or lots of fallen needles indicate a dangerously dried-out tree which should be discarded immediately. Always use nonflammable decorations in the home, and never use lights on a dried-out tree. Candles add a festive feeling and should be placed in stable holders located away from curtains, drafts, pets and children. Never leave candles unattended even for a short time. Holiday lights should be checked for fraying or broken wires and plugs. Follow the manufacturer’s guidelines when joining two or more strands together as a fire hazard could result from overload. Enjoy indoor holiday lighting only while someone is home and turn them off before going to bed at night. 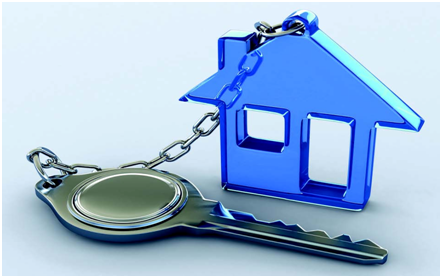 Buying a home can be an arduous process. Following this list of items before closing will make your move more manageable. Whether you want to hire a professional moving company, or just rent a truck and do the work yourself, make sure you book them as soon as you know your closing date. You don’t want to be stuck trying to find a friend with a pick-up truck at the last minute. Of course you’re excited to get the keys to your new house, but you don’t know how many copies of the key the previous owners handed out to friends, family and neighbors. Make sure to book the locksmith as close to your move-in date as possible, so it’s one less thing you’re stressing about the first night in your new home. This one is easy to forget about! Gas, electric and cable all need to be switched over to your new home. Be sure to make the calls at least two weeks ahead of time to play it safe. If you hire out any home maintenance services such as housecleaning, lawn mowing or snow shoveling, make sure to call each one to make sure they have your new address. You wouldn’t want them showing up to find that you’ve moved and have to still pay for the service at your old residence. You likely won’t want to deal with unhappy children or a wandering dog on closing day. Consider leaving your kids and pets with a babysitter, friend or relative for a few days (ideally, during the actual move as well) so they can come home to a somewhat unpacked new place with their new sleeping areas already set up. Chances are your kitchen won’t be unpacked enough to cook in your first few nights in your new home. Be sure to drive through your soon-to-be new neighborhood and collect up-to-date menus from local pizza, deli and any other delicious-looking takeout spots ahead of your move. Closing day is not something to take lightly. Make sure your calendar is cleared of meetings and let your co-workers know that you might not be readily available. Make sure your phone is fully charged in case the closing lasts a few hours. If it’s a quick and painless closing, you’ll be happy your phone is charged to snap a celebratory “Got the keys!” pic for Instagram. For the past few years, oil towns have dominated the ranks of the fastest-growing economies in America. Now that the energy boom is fading, a new leader is emerging: Retirement communities in Florida that are buoyed by a surge in baby boomers. 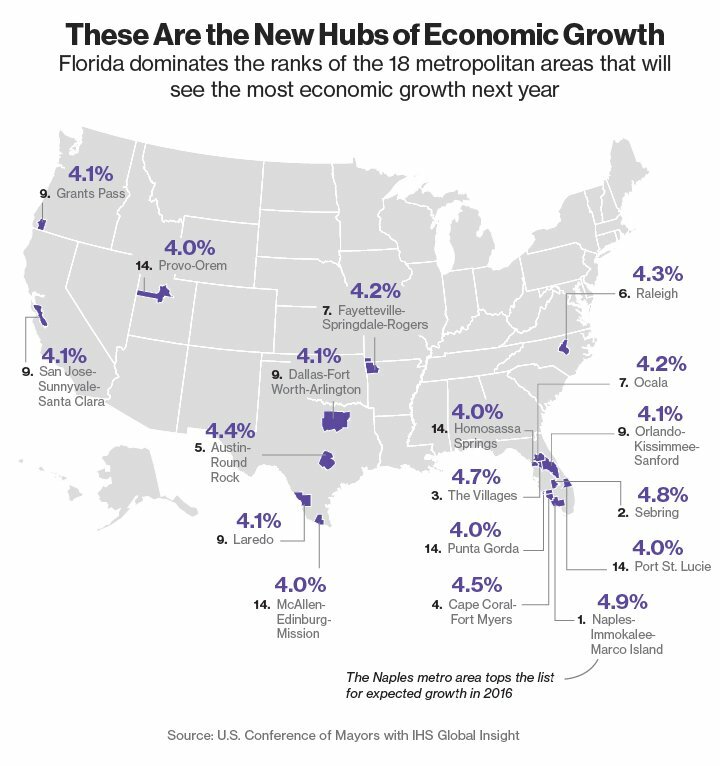 Naples, Florida, topped the list of metropolitan areas that are expected to see the most economic growth next year, according to an analysis of data in a new report from the U.S. Conference of Mayors prepared by IHS Global Insight. The economy there will grow 4.9 percent in 2016, according to the forecasts. 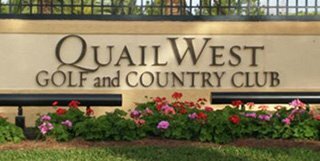 The Villages, a sprawling senior community that has already been the fastest-growing city by population for two straight years, ranked third. The map below shows how metro areas in Florida made up half of the top 18 performers. In 2014, the front runners consisted of mostly energy patch areas, many of which will probably end up as some of the worst-performing economies next year. Nowhere is the shift clearer than in Midland, Texas, which saw the best economic growth in the country in 2014 (11.9 percent) according to the report’s data. The expectation is that it will rank dead last (3.2 percent contraction) in forecasts for 2016. Other areas that are also expected to struggle include Midland’s neighbor Odessa and Casper, Wyoming. With these previous oil and gas hubs tumbling down the ranks, it makes room for Florida’s metro economies to take their places at the top of the list in 2016. Other metropolitan areas slated for growth in 2016 include greater San Jose, California, which makes up the heart of Silicon Valley; Austin, Texas; and Provo, Utah. Christina Fischer, one of Southwest Florida’s luxury home specialists, brings an impressive list of industry credentials to Downing-Frye Realty Inc. With a decade of marketing and advertising experience, Christina implemented some of the brightest, award-winning and trend setting marketing campaigns in Oakland County Michigan. 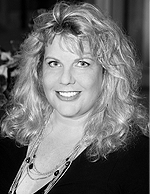 With a decade of marketing and advertising experience, Christina implemented some of the brightest, award-winning and trend setting marketing campaigns in Oakland County Michigan. She has more than twenty years in the design world and a builders background which enables her to touch upon all aspects of home and investment buying. Approachable and hands-on, Christina has a raw talent for zeroing in on her client’s needs while overseeing every phase of a transaction. Invaluable personal experience combined with keen sales and marketing give her Sellers a distinct advantage when it comes to capitalizing on their profits. As for her Buyers, she prides herself on maximizing their dollars in obtaining their dream homes. In her spare time you may find Christina at the golf range or enjoying the festivities on 3rd street downtown. Finally, after 14 seasons visiting Naples she is very happy to now call it her permanent home. Overall activity in the Naples area real estate market across all price categories remains steady, according to the First Quarter 2015 Market Report released by the Naples Area Board of REALTORS® (NABOR®), which tracks home listings and sales within Collier County (excluding Marco Island). 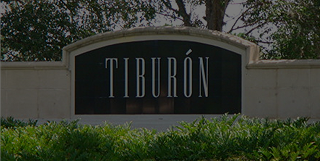 Most notable in the report was the $300,000 – $500,000 price category for condominiums in which the overall closed and pending sales increased by double digits in the first quarter of 2015. 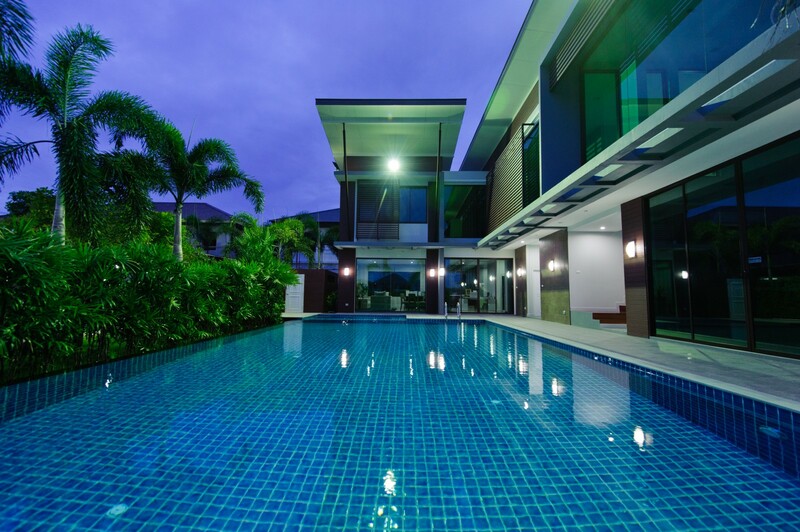 Statistics show a recent shift in buyer focus from single-family homes to condominiums. 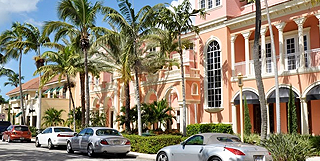 Looking for Naples Condos for Sale? 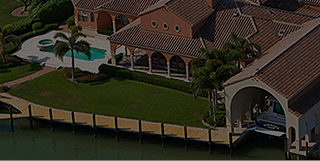 Contact Christina Fischer today at 239.770.0007 and Christina@GolfandGulfestates.com! As typically seen during the first three months of the year, cash sales are on the rise. In January, the 394 cash sales reported accounted for 70 percent of home sales transactions in the Naples area. The report also showed sales of foreclosed homes in January were at their lowest – 64 – since NABOR® began reporting home sales activity in July 2009 when foreclosures numbered 240. 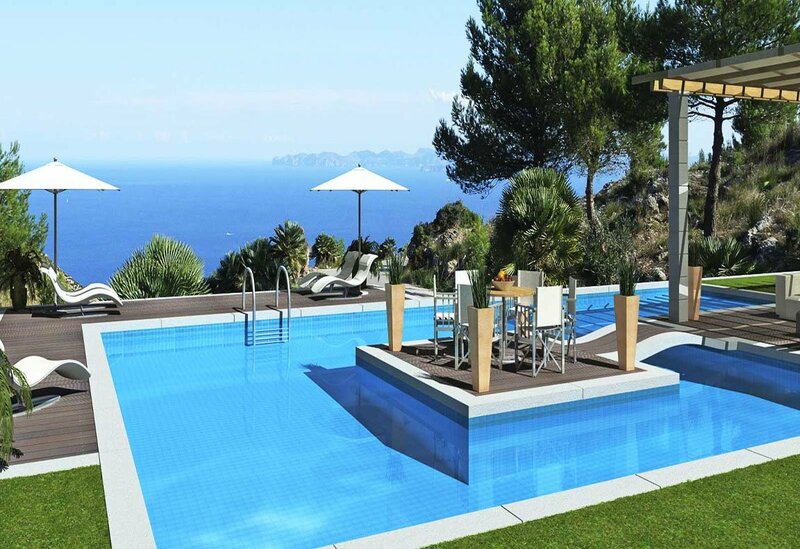 “Activity in the luxury home market continues to be the most impressive,” said a managing broker at a local brokerage house. According to the report, pending sales, based on signed real estate contracts, for single family homes in the $1 to $2 million category increased 53 percent from 36 pending sales in January 2014 to 55 in January 2015, while in the same price category in the condominium market, pending sales decreased 22 percent from 36 in January 2014 to 28 pending sales in January 2015. Not surprisingly, the inventory for condominiums in this $1 million to $2 million category had the largest decline too at 26 percent. 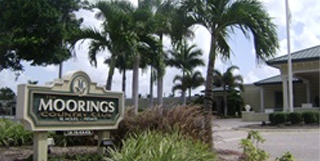 Looking for luxury golf and waterfront properties in Naples and Bonita Springs, FL? Contact Christina Fischer today!